Have a nice day and get lost! Bon Jovi has never been famous for hard rock songs. All the tough-boying and hard looking did not help either! So when they got Hugo Boss to style them it was at least honest in saying: real men do not buy clothes, their mummies do that for them! So they looked slick and so were their songs. Today I saw an ad on the subway promoting their new album. It's called Have a nice day. Come again? Is that for real? HAVE A NICE DAY? You must be jocking! I implore on Amazon to list this album not under Rock but Boy Group or Soft Pop! 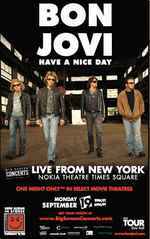 How can any sensible rocker call his album Have a nice day (I know, it should be ironical)? Do you remember the days when bone-breaking tough rocker called their records Appetite for Destruction or just the Black Album and drunk Jack Daniel's? Oh boy, marketing really has taken over the music industry! May rock R.I.P. !